A force in entertainment and fashion with campaigns for brands including Calvin Klein to Fendi under her belt, Davis understands the power of media and how it plays a major role in how we see our identity and how we connect with places outside of our comfort zone. This has been a major reason why she’s used her voice to spread messages bigger than herself and to be part of the dialogue on diversity and even mental health. For Davis, visiting Ghana on the anniversary marking the start of 400 years of slavery was important to not only understand herself and her connection to the motherland—but to also show others that they too can come to Africa and feel right at home. 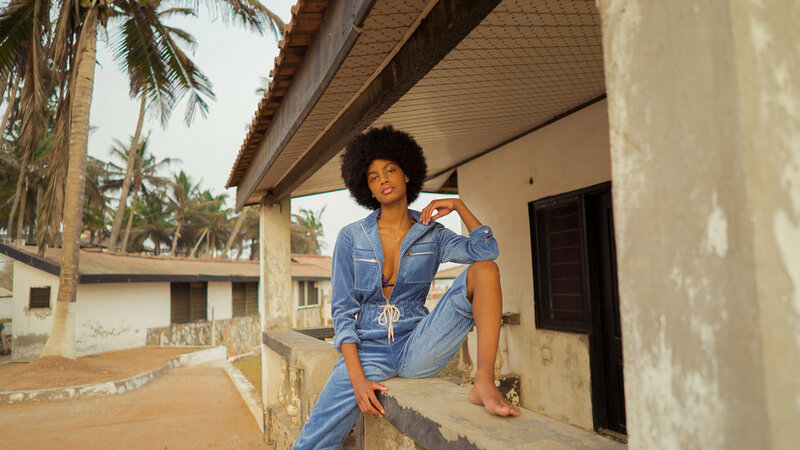 I spoke with Ebonee Davis about her trip to Ghana, her initial reactions and how she feels the fashion and entertainment industries can play a role in transforming narratives on the continent. Here’s our conversation below. 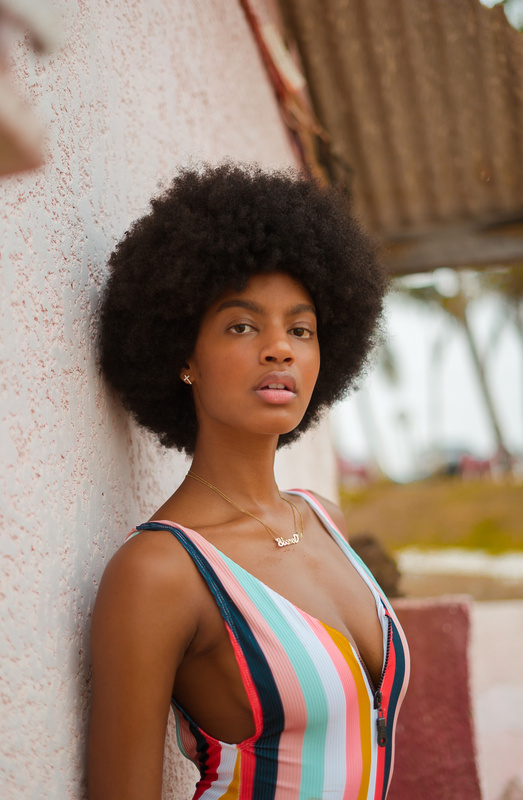 Ebonee Davis: Over the last couple of years, I have befriended many incredibly talented, creative and driven Ghanaians and Nigerians who have inspired me in numerous ways and who have helped me to realize the importance of identity and culture. For a very long time, my sense of self was centered around other people’s interpretations of Blackness and what it looks like to be Black in America. My Ghanaian and Nigerian friends have really helped to facilitate my journey of self discovery and figuring out who I am outside of dominant social narratives. I felt this was the right time to go to Ghana because 2019 marks 400 years since the start of slavery in West Africa. It was a full circle moment for me to return at this time after having been disconnected from my history for so long. Accra is a very energetic with nightlife, restaurants, hotels, an emerging art scene and everything you’d expect to find in a major city—whereas the energy of Cape Coast is a bit more relaxed. That serene energy really supported my Slave Castle experience because it was so profound and intimate for me. Music is a big part of black culture globally. What are you top three go-to afrobeats records you’re listening to right now? “Fall” by Davido and “Energy” by Skepta and Wizkid. I also learned how to shaku while I was there. How do you feel about the “full circle” movement as a while and Black people visiting Africa through these experiences? I think the full circle movement is so important because for many Black Americans, due to what we are taught in school, our point of reference for the beginning of Black history is slavery. It’s great that there is an initiative in place which allows Black Americans to see who we were prior to our abduction and to see that we still have a home we can come back to after all this time. The biggest misconception is that there is nothing but poverty and illness in Africa. The truth is that Africa feeds the world and has been feeding the world for centuries. It’s truly the motherland, not just for Black people, but for ALL people. Another misconception is that Africa needs foreign aid and in reality, Africa just needs foreign people to stop stealing from her, starting wars and perpetuating narratives that center around negative stereotypes so that other people like me will feel compelled to visit and witness her beauty. I do think the media plays a big role in how Africa is painted and it’s up to us to tell the truth, whether that be through film, photography, music or any other creative medium. We are at this incredible time when we have unprecedented control over our own story and we can create the channels through which our content flows. The power is truly in our hands like never before. The shift is here and it’s taking place tight now. I definitely want to return! Now that I’ve visited once, I have an even greater sense of purpose and mission. My overall goal, across the diaspora, is to create conversations around mental health, self worth, and finding an identity outside of what has been handed to us. To me that is true freedom and that is the next step in our liberation as a people. Once you have empowered people on an individual level, economic advancement and development is inevitable. I do think that connecting to West Africa has allowed me to explore a new part of my identity. It’s so refreshing to be in a country where everyone is Black! Everywhere you look you see Black skin! From this trip I have a more expanded idea of who I am, who I can be and what is possible for me. I think that’s what finding your identity is all about: realizing that you are bigger than the box you were previously forced to fit in.